From 1 AM to 2 AM PDT April 25 2006 my fluorescent bulbs were faintly glowing again while the switch was in the off position. The last time this happened was just before the Iran quakes and the series of tornados in the USA. 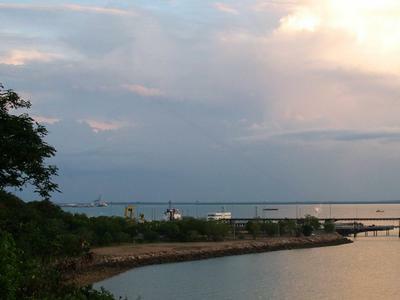 This time, within hours there was a tornado near Oklahoma City. As the new moon is on Thursday April 27 2006, this must an attempt to trigger earthquakes at a time of greater tidal movement in the crust of the earth. Since posting the report on the "Disrupter Beam" (http://educate-yourself.org/zsl/disrupterbeam22apr06.shtml) on April 22 2006 there have been a lot of thoughts sent my way. 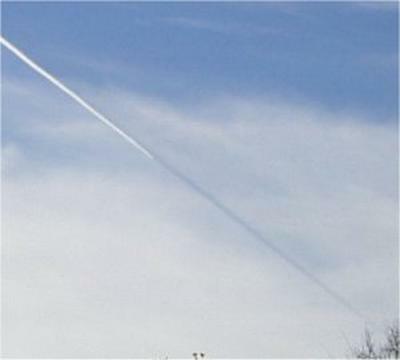 In the same way that many people look up in the sky and do not see Chemtrails, for eight years I knew about DOR lines but could not see them for what they were. 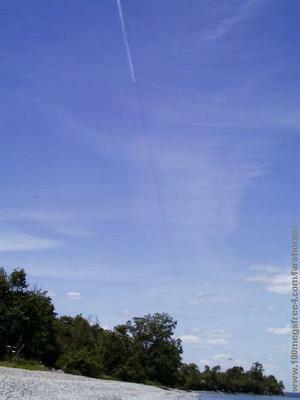 There is a lot of psychic subterfuge around Chemtrails and DOR lines. The sylphs had told me that there were weapons on the Chemtrail planes, on the ground, and in space, but still I was not getting the picture. I call the high energy laser beams 'disrupter beams' because the beams rip air molecules and whatever they hit to atoms and/or plasma. 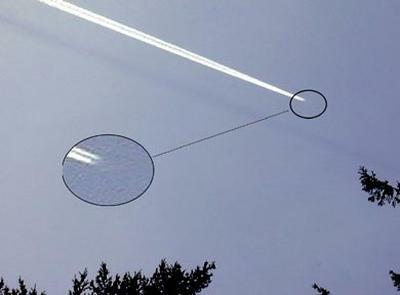 The Chemtrail/disrupter beam project secrecy has been blown. Hundreds of thousands worldwide must have known but still it was hard to see. A lot of mind control on this project. 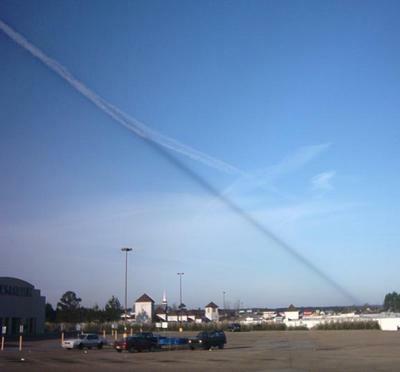 Photos taken from the web of "dark lines" observed occasionally with chemtrail activity. Note the line continues past the trail meaning it can't be a shadow. I have seen cases where the plane vanished mid-flight, like in this photo. I am a regular reader but this is my first E-mail, as it is something that I feel like I have the duty to report. On Friday, June 2nd, 2006, At about 10:30 AM, Mountain Time, I saw 4 military planes flying, one with a black disrupter beam ahead of it. They were flying directly over Paonia, Colorado, towards the west, down what is know as the North Fork Valley. They were at commercial jet altitide, so I could barely see the planes. They were flying next to each other, in formation, with (chem)trails that streched over the Rocky Mountains in the eastern horizon. (Paonia is located on the Western Slope of the Rockies, about 90 miles east of Grand Junction) The plane on the north side of the formation was the one with the black disrupter, or ionization, beam on it. I only knew what it was because I saw the pictures posted on the saltcube link from Zuerrnnovahh-Starr Livingstone's article. 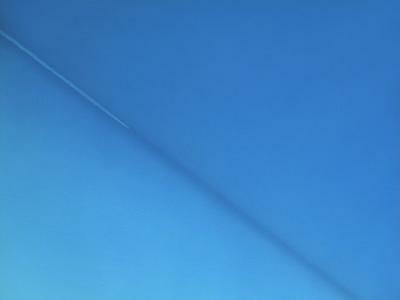 The skys here are clear, still days are often full of chemtrails. There is a spot about 10 miles west of me where they never stick. There might be someone with a chembuster there, I do not know. The chemtrials from the 4 planes I saw today also dissipiated at this spot, but the disrupter beam did not falter in any way. Seeing this happen did not generate an ounce of fear in my body, but it is interesting to note the increased activity. I think that the words of advice to store food and water are wise, as always, but even more so at this moment in time. I took the sighting of these planes as a cue to be aware and prepared. May God be with us in this time of transition.